The Delaplaine Visual Arts Education Center has been serving their Maryland area community since 1986. It has grown from an idea to a vibrantly active nonprofit organization, housed in the 100-year-old Mountain City Mill on the banks of Carroll Creek in historic downtown Frederick. Classes are offered in an ever-growing list of media and subjects for all ages and levels of experience. The small class sizes are led by experienced instructors, who are also working artists. Their award-winning facility features classroom/studio spaces for drawing, painting, crafts, photography, printmaking, wood, and ceramics as well as a reference library. Over 50 exhibits are offered each year, in eight galleries of various sizes. A variety of lectures, art trips, films and more round out the educational experience. They are having a fund raising auction and some of the items up for the silent auction can be seen here. The silent auction is going on now and ends the night of the gala on October 24th. Tickets for the gala are $85/person. I know that I've been nagging you to death over this, but if you miss it, you'll hear about it and wish that you'd gone. It's not just me... so far the Daily Candy, Penn Quarter Living, The Washington Post, The Gazette, The Express, The Hill Rag, and a few others I had not even heard of until recently all say that the place to be tonight is at Flashpoint in DC, for the opening reception from 6-8pm of Andrew Wodzianski's House. Let me re-start with a warning: this exhibit is not for the faint of heart, or the weak of constitution. If you choose to attend, then you take your chances, there will be food and drink and ghosts... and an opening like no art gallery or artsy folks have ever seen before. DC's own Tape Dude does it again... check out the Winston Salem Journal report here. "That's Jenkins as in Mark Jenkins, a famous artist who has stopped pedestrians around the world midstep with his life-size, life-like packing-tape casts of bodies positioned in sometimes strange, sometimes normal, always weird ways. The commotion in Winston-Salem started about 1:15 p.m. yesterday, when police and medics rushed to the corner of Eighth and Trade streets downtown. They'd gotten a report that a woman's body was draped on top of a billboard. They got there, looked up, saw the body and started to climb. When they got to the top, they found not a person needing rescuing, but a plastic "mannequin," put there as part of one of Jenkins' public art exhibits." Mark has gone around the world and certainly has become one of the planet's premier street artists while virtually ignored by museum curators in his own city. 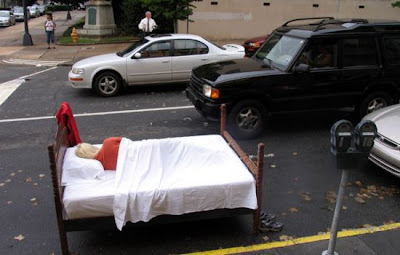 Remember the life-sized car that he made for his Fraser Gallery Georgetown solo show in 2005? Or these below that he installed outside the Warehouse Gallery for "Seven" also in 2005? Hurry! the deadline is this Saturday, October 10, for IMAGE/PROJECT, the Arlington Art Center's juried show for photography and video. Juror: Taryn Simon, a photographer who's shown at the Pompidou, the Whitney, the Met, and many other places. To my good friends Susan Jamison and Akemi Maegawa. Susan Jamison will have a solo exhibition at the Taubman Museum, Roanoke, VA, in March, 2010. Akemi Maegawa's work will be featured in a special installation at the NADA art fair in Miami Beach, "Hello Daruma, Hello Modern," sponsored by the Corcoran College of Art + Design. They are both represented by Irvine Contemporary in Washington, DC. The first shot at the guaranteed to be a very popular mega museum exhibition of Norman Rockwell's artwork in the collection of two very successful, and very progressive major contributors to the Democratic party have been fired. Boom! the first shot came across the bow of the exhibition a few days ago. Boom! In an otherwise quite good and interesting article on the future of photography, the Washington Post's Oxford-educated (yields an Anglo-centric perspective on the world) Chief Art Critic writes that "It's not that art museums never show "low" painting. The Corcoran has shown Norman Rockwell..." It is the classic and antiquated (and uniquely American traditional view) critical perspective of high art and low art. And don't let Rockwell get away with it; it's not high art, it's not high art, it's not high art. Here's the Obama art list. After reviewing this list a little more carefully, and realizing that no politician ever does anything without some political reason, I now think that the Gopnikmeister may have been more on the ball on some of his thinking here than I gave him credit for. Awright... he was right mostly and I was wrong... mostly. And I didn't know that Morandi was a fascist, but I bet that by now the Obamas do! Good job Blake. One last thought: For a real political coup, what the President should have done, in a truly populist move, should have been to mix into the selections about a dozen works by emerging/mid level artists (rather than all museum level artists) and pick a dozen works from the vast holdings of the Arts in Embassies inventory. This is a missed PR opportunity for a PR-hungry White House. Imagine the impact on those artists' local media markets if a local artist would have been picked to adorn the walls of the White House? Whoever advised the Obamas on this caper missed a truly great chance to add votes to the move. By the way, my earlier advice was published here.